As the Canon EF 24-70mm f/4L IS USM Lens hits the streets, Canon has more 50mm prime lenses in its lineup than it has full frame general purpose zoom lenses – four vs. three. I am omitting from my count the large, heavy EF 28-300mm f/3.5-5.6L IS USM Superzoom Lens and the very-wide angle EF 17-40mm f/4.0L USM Lens that could both be used as a full frame general purpose lens, but three lenses in a most-needed lens category is a relatively small number to select from. 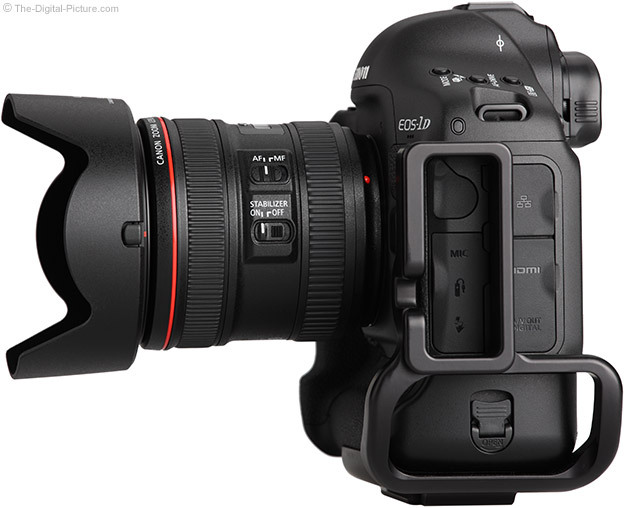 So, I definitely see opportunity for an additional full frame general purpose zoom lens in the Canon lineup. The EF 28-135mm f/3.5-5.6 IS USM Lens that frequents Canon EOS APS-C body kits is a good value at its very attractive price, but its tired design is ready for an upgrade in my opinion. And this lens' full frame corner performance is decidedly lacking. 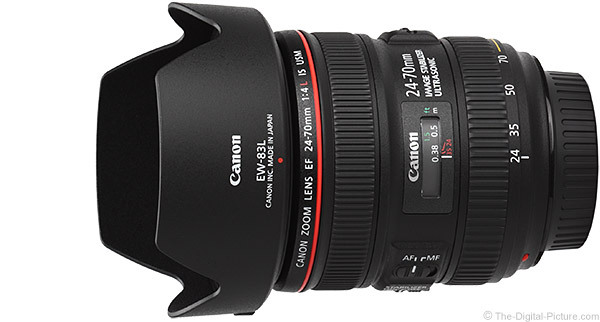 I just completed a review of the other announced-in-2012 24-70mm lens – the impressive Canon EF 24-70mm f/2.8L II USM Lens. The 24-70 f/2.8 II has an action-stopping, background blurring f/2.8 aperture to its advantage over the 24-70 f/4L IS, while the latter holds the size, weight and price advantages in addition to the significant low light handholdability advantage of image stabilization (if the subject is motionless). The f/2.8 lens is a better performer optically. The third lens is the Canon EF 24-105mm f/4L IS USM Lens that has been, at least prior to the 24-70 f/4L IS arrival, my most-used lens since it was introduced. 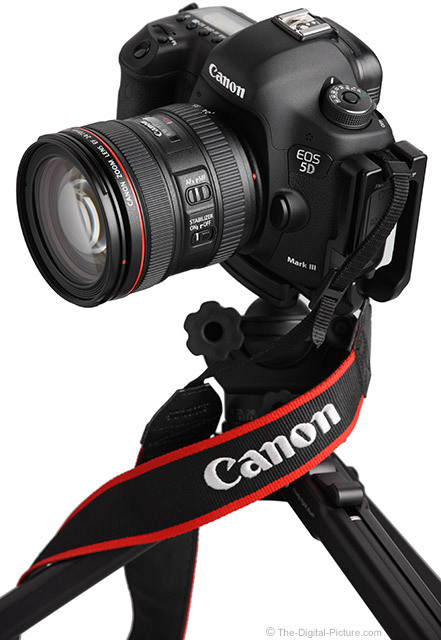 It offers excellent image quality, a wide range of focal lengths and image stabilization. The 24-70 f/4L IS was initially priced significantly higher than the 24-105 L IS and has a shorter range of focal lengths. These two lenses have similar image quality with each winning specific comparisons. To the 24-70 f/4L IS's advantage are smaller size and lighter weight, but I don't find these differences to be of great significance. More important to me is that the 24-70 L has less distortion, especially at 24mm. A strong advantage the 24-70 IS has is the very-impressive-for-a-zoom-lens macro capability. A 0.70x maximum magnification from a non-true-macro lens is eye-opening (more later). I'll make more comparisons throughout this evaluation, but to displace the long-time bestselling 24-105mm lens was going to be a challenge for the 24-70 f/4L IS. A challenge unless the 24-105 L was discontinued, or what actually happened, the prices were minimally equalized or the 24-70's price became lower. Canon does not typically disclose their discontinuance plans and, still long after review time, the 24-105 L remains an active product. From the announcement date, I was very optimistic about the overall image quality from this lens. We saw the image quality Canon can deliver with the 24-70 f/2.8L II – and I expected similar from this lens. Image quality is what I expected to be this lens' biggest selling point. 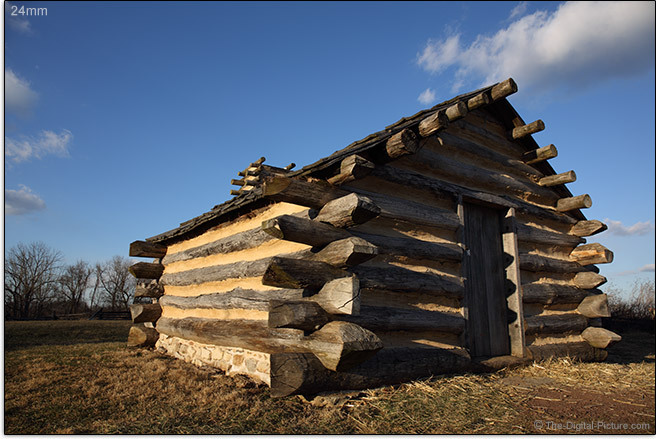 Landscape and travel photographers especially will move over to the 24-70 L IS from the 24-105 L IS if they can see sharper details in their images – especially in the corners. I've probably worn out the general purpose lens term, but ... this focal length range lands squarely into what I consider to be ideal for that use. The second set of examples comes from a large university gymnasium. Sorry, I don't know how the basketball became lodged in the steel beam at that height (but I'd love to know). The 24-70mm focal length range (FLR) can work excellently for travel, landscape, product, street, still life, portraits ... and a mind-numbing list of other photography uses. I usually have a lens with this covered range with me whenever I'm shooting. On an ASP-C/1.6x FOVCF sensor format DSLR, the 24-70mm FLR frames like a 38.4-112mm lens on a full frame body. The uses for a such-mounted lens are similar, but portraits become favored to landscapes due to the lack of landscape-favoring wider angles of view and gain of portrait-favoring narrower angles of view. While suitable for close range sports and action, the f/2.8L II is the better 24-70mm lens version for this pursuit. The f/4 max aperture is medium-fast, but the f/2.8 aperture lets twice as much light into the camera. That the f/4 max aperture is fixed over the entire focal length range means that your wide open aperture exposure settings do not change with zooming. I consider this to be a valuable attribute for any zoom lens to have. 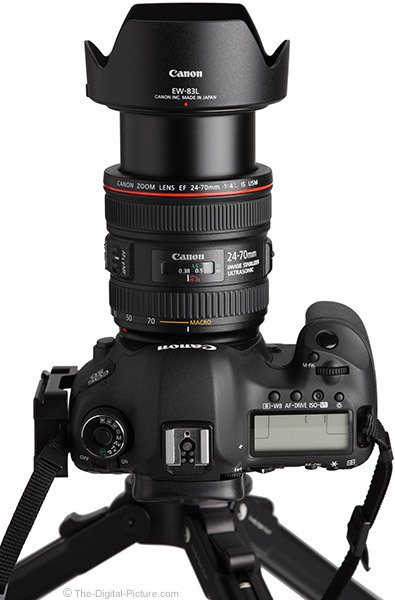 The Canon EF 24-70mm f/4L IS USM Lens receives Canon's 4-stop Hybrid Image Stabilization feature (the 24-105 L has 3-stop non-Hybrid Image Stabilization). With an approaching-1:1 macro reproduction ratio, this lens will make good use of the HIS technology: "Hybrid IS detects [and corrects] both angular and shift movements when in macro mode." [Canon] More about this later. Many have said that image stabilization is not important in wider angle lenses, but for at least for some uses, I strongly disagree. I am frequently shooting with wide angle lenses in situations where a tripod is not practical – and where deep depth of field is important (think f/8 or f/11). Add wind, unstable footing, a CP filter, a state of out-of-breathlessness ... IS can even be needed even under full sunlight. Yes, today's DSLRs deliver incredible image quality at high ISO settings, but, blue skies look MUCH better at ISO 100 than at ISO 800 or 1600. With this lens, at 24mm, I am getting very good image sharpness with .3 second exposures (about 3 stops of assistance), still decent results at .4 seconds (3 1/3 stops) and only marginal results on average at .5 seconds (3 2/3 stops). At 70mm, the 24-70's IS is producing very good results at 1/6 second exposures (3 2/3 stops) and good results at 1/5 second (4 stops). Results are not good on average at 1/4 seconds. But sometimes one sharp picture is all you need – and with enough attempts, one sharp picture is accomplishable. The 24-70's IS system is very nicely implemented with no viewfinder jumping during startup or during panning motion. 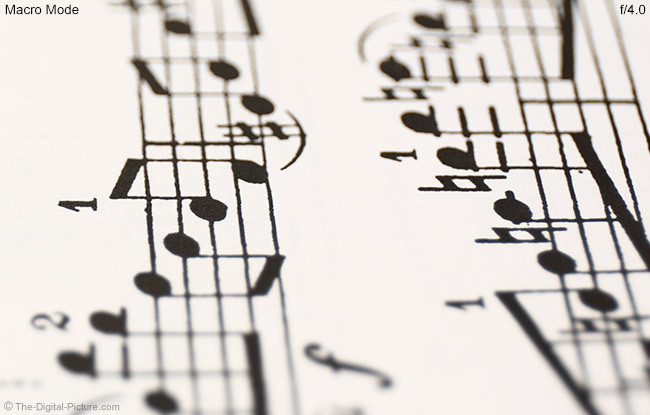 A soft click is heard when IS starts and again when it ends. 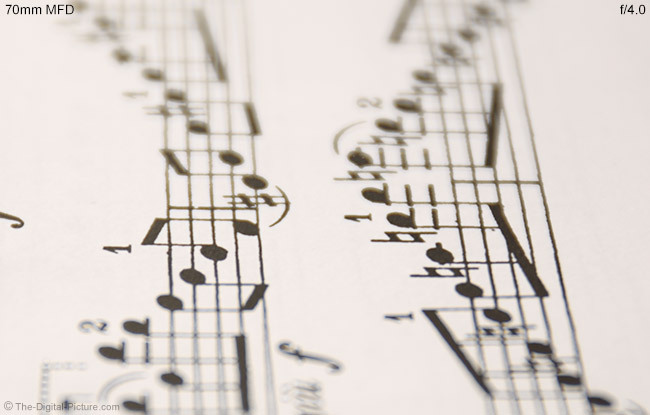 A quiet hum can then be heard in a quiet environment during activation. IS is a great feature that I lament being absent on the 24-70 f/2.8L II. As usual, we had the 24-70 IS's MTF chart available at announcement time. Here is a look the theoretical comparisons. Canon has been turning out impressively-performing zoom lenses recently and I was quite excited to see a repeat performance from this lens. After evaluating three retail-purchased copies of this lens, here are my observations. With a wide open f/4 aperture: At 24mm, the Canon EF 24-70mm f/4L IS USM Lens is very sharp in the center with good sharpness extending to the periphery of the full frame image circle. This lens gets very slightly softer at 35mm and modestly softer yet (especially in the mid and peripheral image circle) at 50mm f/4 where the lens performs its worst. Sharpness improvement by 70mm brings the 24-70 f/4L IS back up to performance similar to that at 35mm. Stopping down to f/5.6 creates a minor improvement in image quality (especially from a noticeable decrease in peripheral shading). Improvement in sharpness is most notable at the long end. Another small sharpness improvement is noticeable in the mid and long focal lengths with an aperture narrowed to f/8. Results remain slightly soft at 50mm. That this lens performs its worst at a mid-focal length vs. an extremity focal length is unusual. Since most people shoot their highest percentage of images at the focal length range extremes of a lens, the 24-70 L IS weakness is perhaps well placed. Roger at LensRentals.com has confirmed the 50mm weakness in his vast stock of this lens. While this lens turns in very good image sharpness, I honestly was hoping for amazing sharpness – and not meeting expectations always causes somewhat of a let-down for me. I have to keep things in perspective – and this is still a great lens. If you are shooting at f/11, the 24-70 f/4L IS, 24-105 f/4L IS and 24-70 f/2.8L II lenses produce essentially equally excellent sharpness. At 24mm with a wide open aperture, the 24-70 f/4L IS bests the 24-105 L IS in sharpness by a modest amount. The 24-105 L delivers a sharper image at 50mm f/4. Sharpness improvement at 70mm brings the 24-70 f/4L IS back up to near equality with the 24-105 L. These two lenses perform more similarly at f/5.6 and at f/8 where their results are nearly comparable. Again, the results are similar at f/11. The Canon EF 24-70mm f/2.8L II USM Lens is the sharper lens of this group – even at f/2.8 vs. f/4. 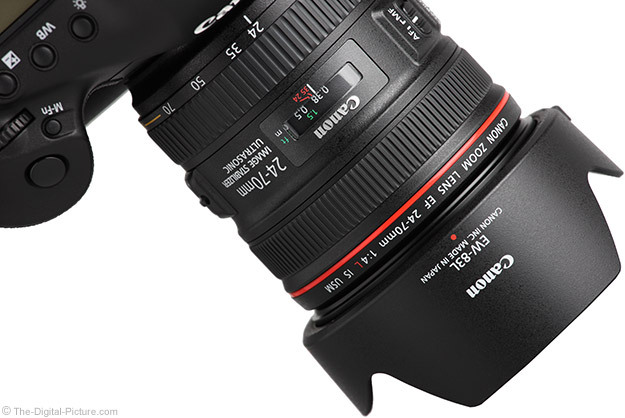 Note that the Canon EF 24-70mm f/4L IS USM Lens exhibits some focus shift. Whether it will affect your images or not is questionable. I'll explain. Even at MFD (Minimum Focus Distance), the increasing depth of field easily covers the focus shift at 24mm, though subjects in front of the point of focus do not come into focus as quickly as background objects do. However, this is not the case by 70mm MFD where the point of focus goes slightly out of focus at midrange apertures as demonstrated below (33% resolution shown). The f/4 image will show the point of sharp focus. Watch how the depth of field changes as the lens is stopped down to a narrower aperture. Move the 70mm subject out to about 3' (1m) and DOF once again covers the focus shift as demonstrated below (100% resolution shown). Again, find a point of sharp focus in the f/4 image and watch how it changes as the aperture narrows. The focus shift is still present in the example above, but the point of focus does not become less sharp. With the macro capability this lens has (and the rather soft image quality at 70mm MFD with wide apertures), I suggest avoiding use of 70mm at the MFD. Shift into the specialized macro mode for these needs. I'll talk more about macro mode later, but to use this mode simply requires rotating the zoom ring beyond the 70mm focal length via a switch. There is a range of zoom ring rotation designated for macro use with a significant subset designated as the suggested range. Some focus shift remains in the wider angle rotation portion of the macro mode, but the shift clears up in the mid and longer suggested range. There may even be a slight focus shift forward at the furthest recommended rotation setting as demonstrated below (33% resolution shown). Use the left-most "1" as a point of sharp focus reference. 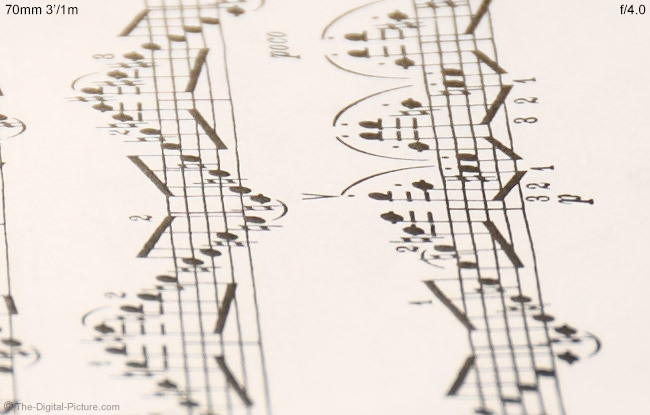 Don't use the above samples for image quality evaluation as the quality of the sheet music printing is not good, the lighting was not critically controlled and many of the results are reduced. 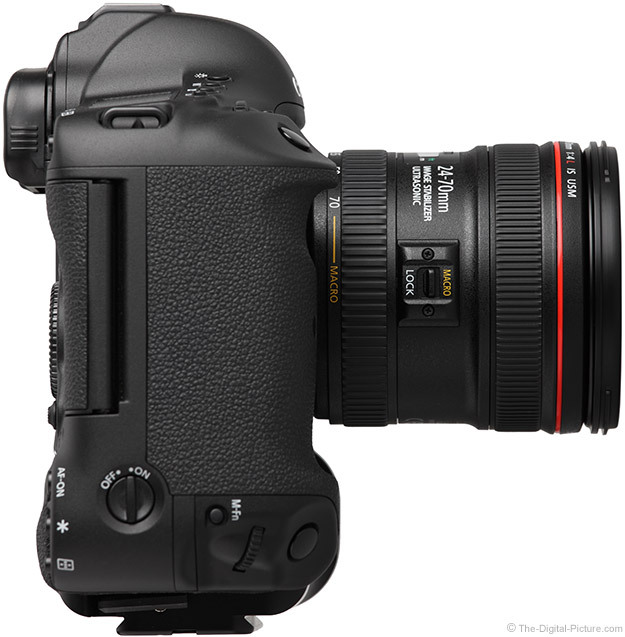 You will see very low distortion from the 24-70 f/4L IS relative to similar zoom lenses. Expect to see light-but-noticeable barrel distortion at 24mm. This lens is near distortion-free at 35mm and shows mild pincushion distortion over the longer end of the FLR. The 24-70 f/4L IS shows less distortion than the 24-105 f/4L IS – and significantly less at 24mm. Landscape photographers shooting over a flat horizon (such as water) will especially appreciate the difference at their most-frequently-used focal length: 24mm. Having a distortion-free lens makes leveling the framed scene much easier and reduces the destructive distortion correction needed during post processing. There will be a small amount of CA (Chromatic Aberration) in the peripheral image circle at 24mm, but the 24-70 f/4L IS is nearly void of CA until the longer end of the focal length range where mild CA becomes apparent at 70mm. The 24-70 f/4L IS has noticeably less CA than the 24-105 f/4L IS at the wide end, but more at 70mm. 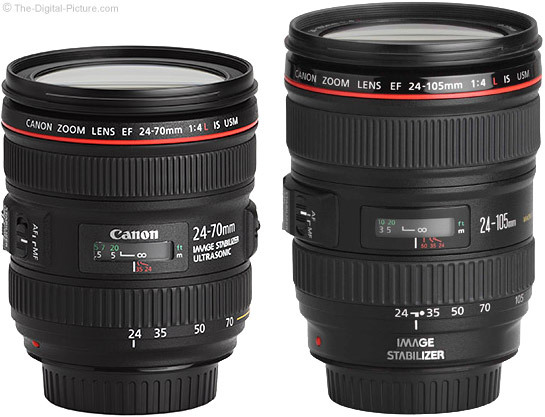 The 24-70 f/4L IS is similar to the 24-70 f/2.8L II in regards to both CA and distortion. Full frame format DSLR images will see about 2.5 stops of f/4 peripheral shading at 24mm, 1.4 stops at 35mm, 2 stops at 50mm and 2.5 stops again at 70mm. By f/5.6, much of the vignetting is gone, though about 2 stops remain in 24mm corners and a just-noticeable 1-stop remains at 70mm. Little change is noticed by stopping down to f/8 or f/11. The 24-70 f/4L IS has less vignetting than the 24-105 f/4L IS at the wide end at f/4, but more at the long end. By f/5.6, the two lenses are close in this regard. The 24-70 f/2.8L II, with its 1-stop wider aperture, has the comparable-aperture vignetting advantage until about f/8 where the two are nearly equal. This lens features Super Spectra coatings to reduce flare and increase contrast. While the increased contrast part appears successful, I'm not as amazed with the flare performance from this lens. You will want to avoid the sun in the frame at all focal lengths and apertures – unless you want the artistic effects of flare. The 24-105 L and 24-70 L II show slightly less flare, but not enough less to be a differentiating factor. While a 24-70mm f/4 lens is not going to be considered amazing for its background blur creation capabilities, it can create blurred backgrounds – and the quality background blur (bokeh) created by this lens and its circular 9-blade aperture is very aesthetically pleasing. Here is a 70mm f/8 example that specifically shows how specular highlights are treated. Canon has once again used a fluorine coating on the exterior surfaces of this lens. This coating makes the exposed lens elements much easier to clean – especially in the field. While an f/4 max aperture lens will not light up the highest precision autofocus capabilities of some Canon DSLR cameras, the Canon EF 24-70mm f/4L IS USM Lens still performs very well (and very fast) with Ring USM driving its AF system. The difference in focusing speed between this lens and the 24-105 L is imperceptible to me. The 24-70 L II appears to focus slightly faster, but this is still not easy to discern. AF accuracy from this lens has been very good – performing well even in AI Servo mode. This lens focuses very quietly with a light "shhhh" heard during autofocusing. The 24-70 f/4 IS L does not extend with AF and FTM (Full Time Manual) focusing is available (no switch change is required to manual focus after autofocusing). Filters do not rotate during autofocusing. A smooth, well-damped, nicely-sized manual focus ring with practically no play and a nice amount of rotation (108°) available makes fine focusing easy. I appreciate the forward position of the manual focus ring with the zoom ring to the rear, where my supporting hand rests. The 24-70 f/4L IS exhibits some focus breathing (subjects change size with focus distance change), but the amount of size change is not drastic. 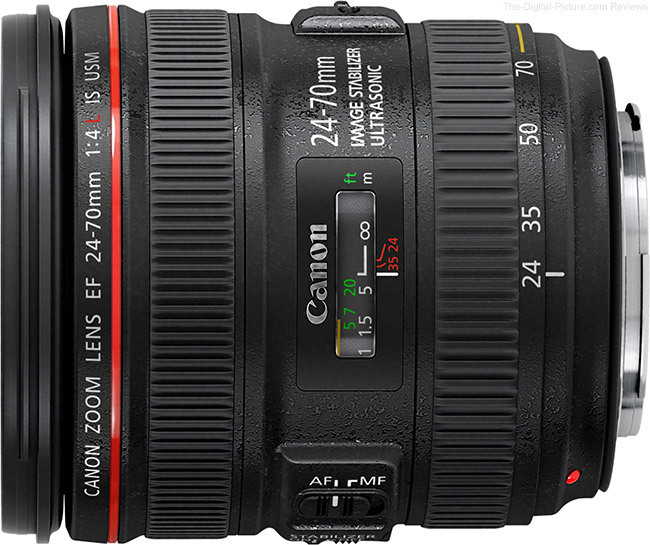 In the 24-70mm f/2.8L II review, I lamented about the loss of maximum magnification (MM) from the preceding Canon EF 24-70mm f/2.8L USM Lens. No lamenting this time. The 24-70 f/4L IS' maximum reproduction ratio blows away all Canon non-true-macro lenses before it. Within the normal focal length range settings, this lens has a good, but not unusual, MM of 0.21x at a minimum focus distance of 15" (380mm). This means that a subject can be reproduced at 0.21 times its real life size onto a sensor. A 100mm subject can be made to cover 21mm of a sensor (which of course looks huge on your monitor). By pushing a spring-loaded switch (shown above), the zoom ring is able to move into (and lock within) a range of macro focal lengths. The lens extends slightly as it transitions into the macro range, but settles back to shorter-than-70mm physical length by ~80mm as shown below. These focal lengths are not really longer than 70mm, though some cameras (including the 1D X) will report focal lengths of up to 80mm. 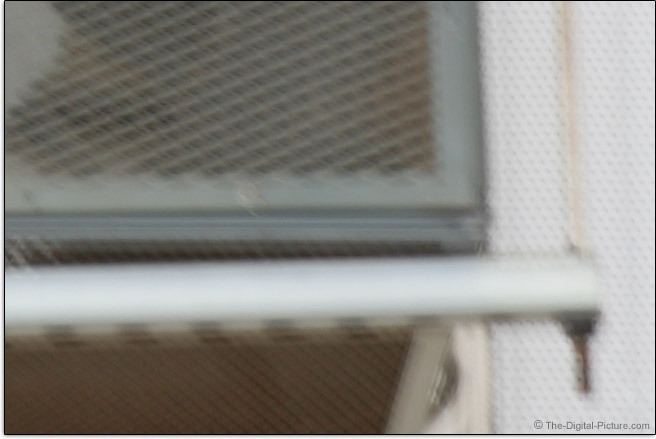 From the zoom ring action, it would seem as though the lens is being adjusted to a longer focal length. When zooming within the macro-restricted range, the lens acts like it has a variable length extension tube installed. As the zoom ring is moved from the 70mm side of the macro setting to the ~80mm side, the lens focuses on subjects closer to the lens – but the maximum focus distance is reduced. The focus ring still provides a range of focusing within each ~focal length setting. As the lens is zoomed to ~80mm (again, not really 80mm), minimum focusing distance reduces to 7.87" (200mm). Since MFD is measured from the imaging sensor plane, the working distance (WD) is considerably less. At 7.87" (200mm), there is about 1.2" (30mm) of WD remaining between the front lens element and the subject. Forget using the lens hood – it is longer than the WD – and lighting within the small opening between the lens and the subject becomes a challenge. Minimum image degradation occurs when a focus distance setting within a yellow line on the focus distance scale is used (partially visible in the above picture). This setting range is from about 3' to 5+' (0.8-1.5m) (note that these are not actual focus distances in macro mode). You can achieve a magnification of about 0.5x at the minimum recommended focus distance at ~80mm – with a working distance of just under 2.5" (64mm). Let's look at some examples. 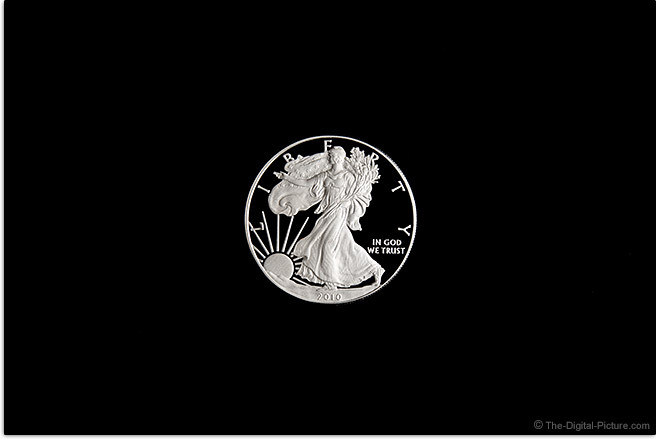 The Canon 1D X-captured subject below is an American Eagle Silver Dollar proof coin measuring 1.597" (40.5mm). Lighting is from a Canon 600EX-RT Flash, Canon ST-E3-RT and a softbox mounted on a backlight stand. The 0.21x magnification is average for a zoom lens – and is the MM for this lens in the normal focal length range setting. Magnification in macro mode is based on zoom ring position, focus ring position and subject distance. The center 2 examples show the range of magnifications available within the recommended (for optimal image quality) focus distance range at ~80mm. The 0.70x example shows absolute MM. Just because a lens has a macro feature doesn't mean that you will actually want to use it – especially if the image quality does not satisfy. Not a problem in this case. 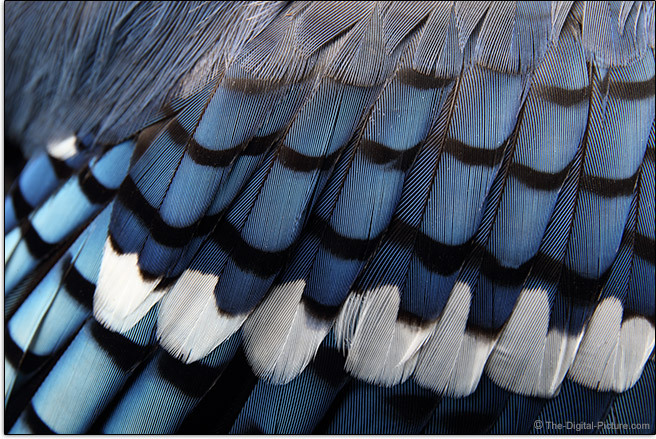 Let's look at some feather detail on a Blue Jay. The above images were captured with a 1D X set to f/11 to get as much DOF as possible (DOF becomes very shallow at these short focus distances). A DPP sharpness setting of "2" (very low) was used to process the raw images. In the full image, you can tell that I'm struggling to evenly light the wing. A macro ring light would have been a good option in this case. Even outside of the recommended focus distance, the 0.7x crop is sharp – and has good sharpness right into the frame edge. Moving slightly farther away gives us the approximately 0.5x crop with slightly better sharpness – and more DOF. I'm not going to say that this lens is as sharp as the Canon 100mm L Macro Lens, but the Canon 24-70 f/4L IS Lens' macro mode is very impressive. This lens could easily displace a macro lens in your pack – which in turn makes the size and weight difference of what you are carrying big. HIS is activated in Macro mode, but IS is less effective at closer distances. 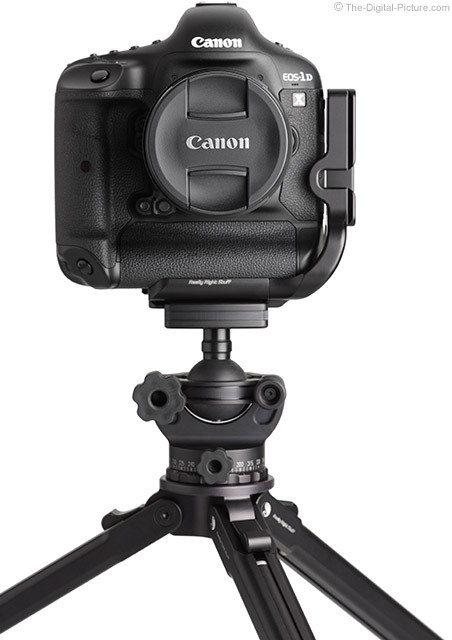 Canon has used between 1 and 2 stops as the reduced affectivity figure and also has stated IS effectiveness to be 3 steps at 0.5x and 2.5 steps at 0.7x. IS definitely makes handheld framing of close subjects easier. While the 24-70 f/4 IS is still compatible with extension tubes, I don't know why you would use them. With a 12mm Extension Tube in place, the non-macro-mode maximum magnification spec goes to 0.44-0.18x. The 25mm Extension Tube takes the spec to 0.72-0.40x. Interesting that 25mm of extension results in a 0.72x max magnification while the built-in macro features a 0.7x spec. Extension tubes shift the lens farther from the camera mount. When looking in the rear of the 24-70 L IS as it is shifted into macro mode, the rear element does retract into the lens by increasing amounts up to ~80mm. The total retraction distance is about 0.5" – or 12.7mm. This is obviously not 25mm, so additional lens element action is being used to accomplish this magnification feat. Following is a comparison table showing the MFD and MM of many Canon lenses. Nothing is close. 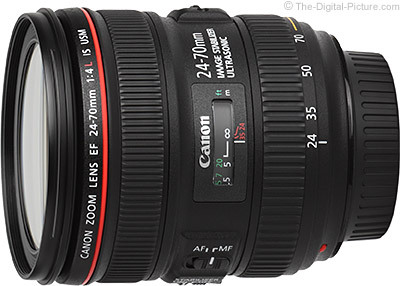 The MM spec alone will sell a lot of Canon EF 24-70mm f/4L IS USM Lenses. As usual for standard zoom lenses, this lens is not compatible with Canon Extenders. Like most standard zoom lenses, the 24-70 f/4 IS extends as focal length is increased – by 1.21" (30.8mm), which is 0.02" (.5mm) less than the 24-70 f/2.8L II extension amount. 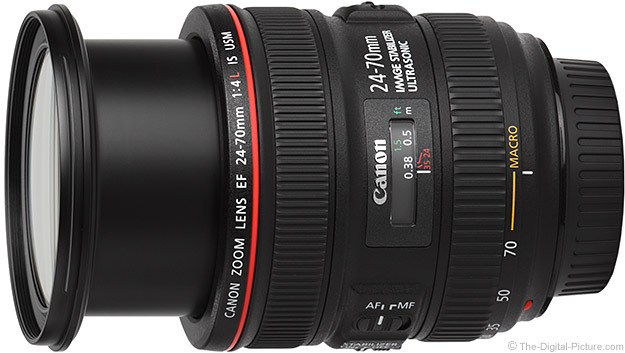 Like all Canon L Lenses, the 24-70 f/4L IS is built for professional use with quality construction. Fit is tight and finish is tops. This lens looks great, has a great feel and has solid build quality. Based on an engineering plastic barrel, the extension, zoom rings and the rest of the lens are solid with practically no play. The zoom ring is nicely damped with a very slight slip-stick characteristic that I expect will go away with break-in. Gravity zooming (lens extends by itself when pointed downward) is not an issue, but a lock switch (combined with the macro switch) enables the lens to be locked at 24mm. This is a weather-sealed lens, though I suggest using a protective front filter to insure no moisture enters around the front element. The size and weight of the Canon EF 24-70mm f/4L IS USM Lens are such that this lens is very easy to carry and use – even for long periods of time. For many more comparisons, see the complete Canon EF 24-70mm f/4L IS USM Lens Specifications using the site's Lens Spec tool. Here is a visual comparison of a subset of the above lenses. I've been complaining about Canon's old side-pinch-only lens caps for a very long time. 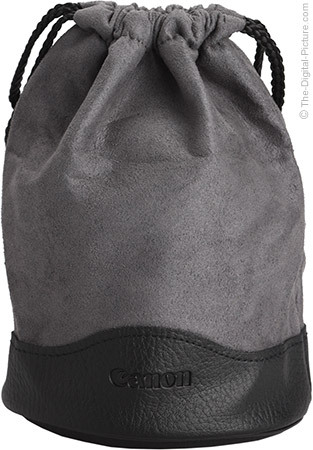 It is so refreshing to get the excellent new Canon Lens Cap II as shown below. This cap is easy to remove inside of the installed lens hood. The 77mm filter size has long been a standard for Canon L zoom lenses. While the EF 24-70mm f/2.8L II veered from this standard, the 24-70 f/4L IS once again assumes it. There is benefit to lenses sharing a similar filter size, though I usually want a filter for each lens anyway (saves the filter change time in the field). A standard 77mm circular polarizer filter will add a slight amount of vignetting at 24mm. I recommend a B+W 77mm HTC XS-Pro CP filter for this lens (what I'm using). 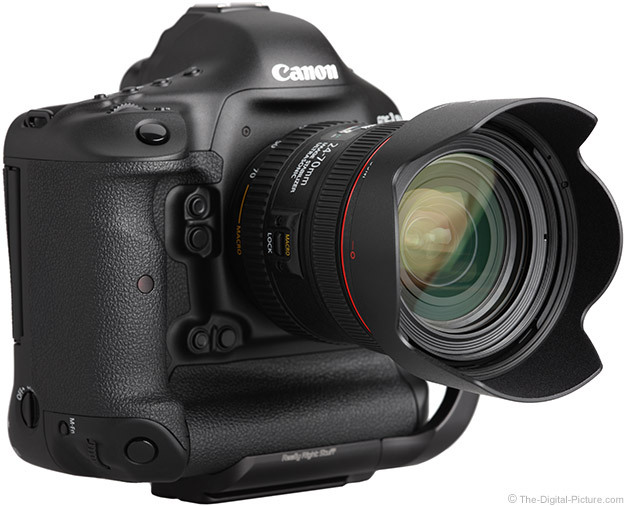 The 24-70 f/4 IS comes with a EW-83L lens hood and an LP1219 draw-string pouch included. 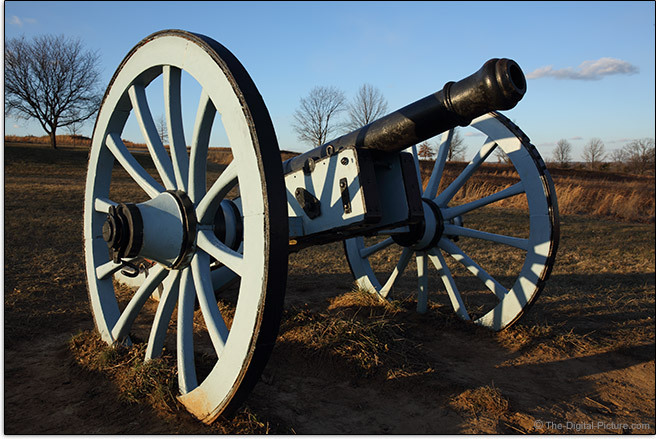 Getting a photo of a cannon in Valley Forge National Historical park is easy. Getting a warm light on the cannon simply means timing your photo with a late day sun (or early day sun depending on which cannon you are shooting). Having a little cloud that looks like smoke coming from the cannon come by at the right time? Priceless. Which Canon you shoot your cannon with is another question. The Canon EF 24-70mm f/4L IS USM Lens worked great for my short trip to this park (and of course in many other closer-to-home uses I've found for it). I was shooting in high winds with very cold temperatures. I used a tripod at times, but run-and-gun style shooting using IS allowed me a significantly greater take-home than I would have otherwise had. 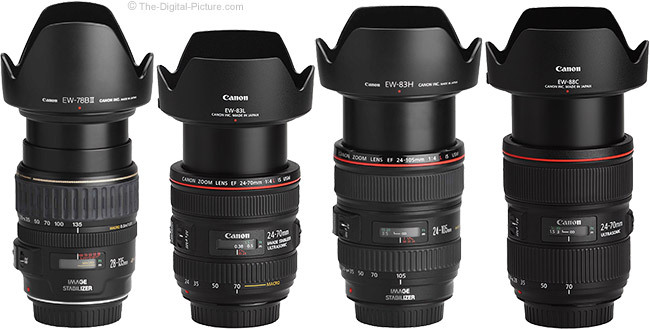 I see the primary alternative to the 24-70 f/4L IS being the Canon EF 24-105mm f/4L IS USM Lens. Deciding between these two lenses was a challenge for me. 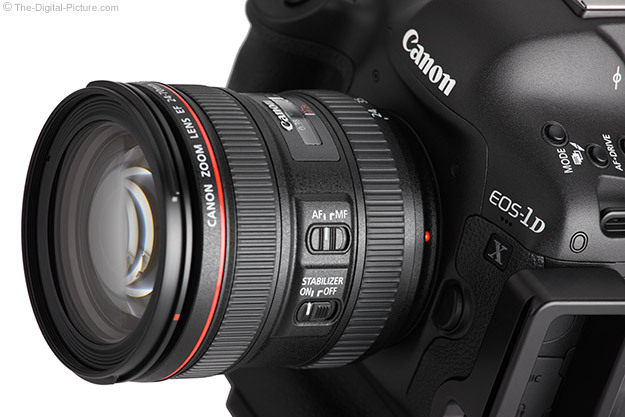 I shared my thoughts in this page: Should I get the Canon EF 24-70mm or 24-105mm f/4L IS Lens? As I shared on that page, I decided that the 24-70 f/4L IS was the right choice for me and have been very pleased with its performance. I have used this lens from the four corners of the USA and many locations between them. With the introduction of the Canon EF 24-70mm f/4L IS USM Lens, Canon's full frame general purpose lens category has another great option and that option is a great one. 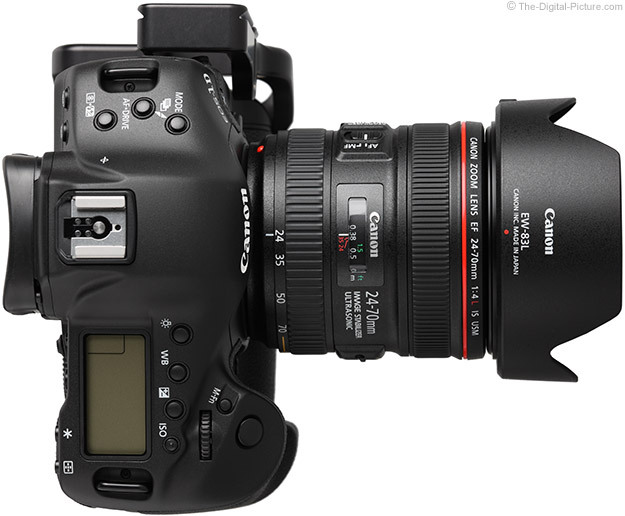 Should I get the Canon EF 24-70mm or 24-105mm f/4L IS Lens? 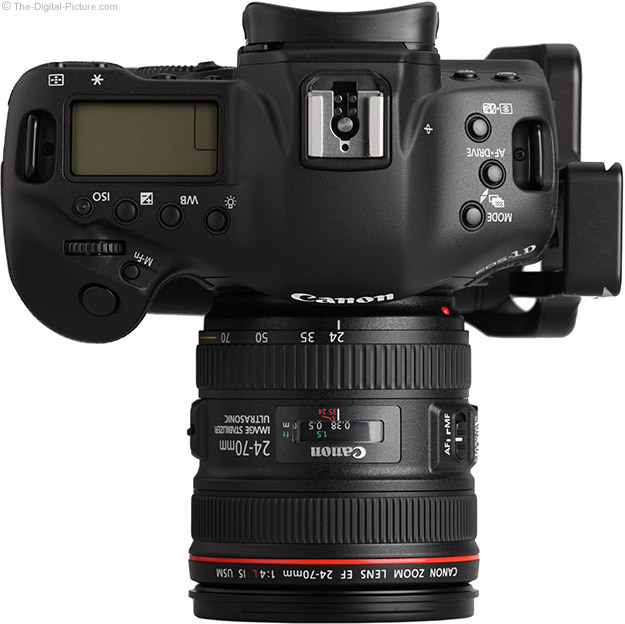 Should I get the Canon EF 24-70mm f/4L IS or 24-105mm f/4L IS II Lens?